At this point, it's no secret that shopping for jeans can be one of the most infuriating retail experiences. Whether you're tall, short, curvy, skinny, athletic, or just about any body type, the experience of trying on jeans generally ranges from mildly annoying to utterly horrifying. Well, all hope is not lost, ladies! We've figured out the one jeans style that truly flatters every body type: the high-rise jean. The higher waistband not only legthens and slims your legs, but it also pinches in your waist and creates the illusion of a feminine shape. This is something we can all get behind, right?! 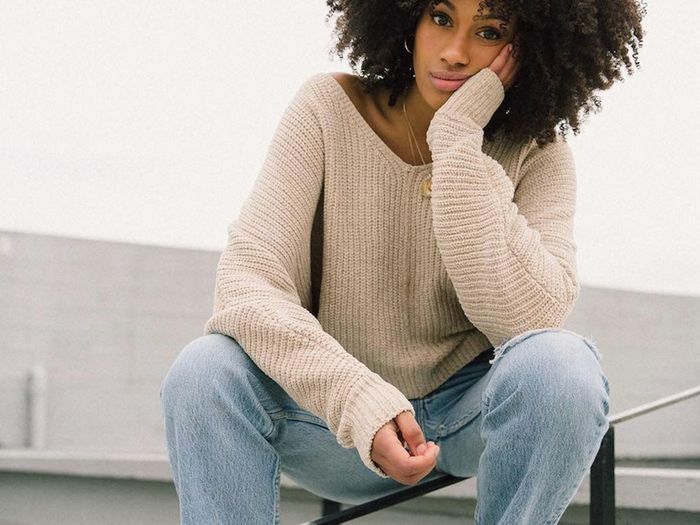 Keep scrolling to see how some of our favourite street style stars and bloggers wear high-rise jeans, and to shop a few ultra-stylish pairs yourself! For the curvier gal, a good pair of high-rise jeans is truly your best friend. They highlight the tiniest part of your body (your waist) while simultaneously amplifying your curves. Ladies blessed with bountiful height might shy from high-rise jeans, because they tend to give the illusion of even more length—and to that, we say, pish posh! If you're already naturally talll, you might as well highlight your gifts, right? For ladies with less curves, the high-rise is your friend too! The extra fabric at your hips can help give the illusion of curves (if that's your sort of deal). If you're a bit on the shorter side, high-rise jeans help make your legs look way longer than they might naturally be. The key is making sure the length is just right, with the hem hitting just above your ankles. For the plus ladies out there, a pair of high-rise jeans minimizes the waist while drawing the eye to the parts of your body you most want to show off! If you've been blessed with a thin frame, a longer inseam helps add a bit of shape while lengthening your legs and accentuating your thin frame. For those of us whose days in the gym have really paid off, the jean style helps minimise the appearance of musculature without downplaying curves too much. If your hip region is a bit wider that your torso, then you'll love the way high-rise jeans help you look more balanced from top to bottom. Keep scrolling to shop stylish high-rise jeans now! Do you think high-rise jeans work for you? Tell us in the comments below!